Children acquire important learning skills through play. While they’re figuring out which button produces which sound or attempting to match a square-shaped block to its corresponding cut-out, they’re mastering important life skills such as critical thinking, communication, and collaboration. The National Association for the Education of Young Children (NAEYC) agrees that age-appropriate toys can double as teachers of early learning skills while helping to foster curiosity, as well as social and emotional skills. But with so many toys vying for parents' dollars, it can be tricky to figure out what to bring home. To make matters less complicated, parents may want to consider heeding the NAEYC’s advice on how to choose appropriate and safe toys. Little ones between 7 to 12 months old understand their own names and other common words, can identify body parts, find hidden objects, and put things in and out of containers. Things to drop and take out, such as plastic bowls or nesting toys, make good toys for babies this age. LeapFrog’s new Stack and Tumble Elephant, available Fall 2017, may be just right for older infants. Stacking five textured rings on the elephant’s trunk helps build fine motor skills. At the same time, the elephant introduces colors, numbers, and shapes. Push down on his tail, and he’ll sneeze the brightly colored rings right off his trunk. Babies master quite a few skills in their first year of life. By their first birthday, a baby can typically walk steadily and even climb stairs. One-year-olds also enjoy songs and stories, pretend play, and toys with parts that do things. Step and Learn Scout, also part of LeapFrog’s recently expanded line of infant toys, aims to help kids learn letters and numbers while encouraging pretend play and gross motor skills. Scout can be pulled on a leash or manually scooted on the floor. The happy pup sings educational songs while sporting letter and number graphics on his LED backpack. 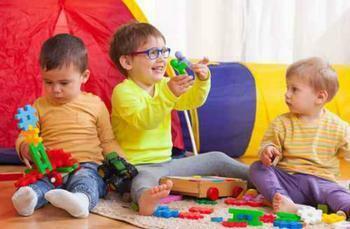 Toddlers are rapidly learning language and enjoy toys that enable them to solve problems, build, and create. Pretend play is also usually on a 2-year-olds list of favorite activities. LeapFrog’s new Scoop and Learn Ice Cream Cart lets kids pretend and create while following directions to complete their customer’s ice cream order. Memory and sequencing skills can be built upon as little ones attempt to make sure their creation matches the image on the ice cream order card. Kids can add pretend syrup as they count along from 1 to 10, then ring up the customer’s order using the cash register. For the two-and-older set, LeapFrog has also come out with a new kid-friendly educational laptop, called the 2-in1 LeapTop Touch. Using the laptop's number buttons and A-Z keyboard, kids can pretend to email their pal Scout or play learning games. All new products on LeapFrog's expanded range of infant and preschool toys will be available later this year. When choosing toys for infants and young children, parents should look for products that are shatterproof, well-made, painted with non-toxic paint, and easily cleaned. Additionally, it's important to make sure the toy has no small parts or pieces that could pose a choking risk.